What is a Gnu, Where Does it Come From, and How Do Gnus Defend Themsleves Against Predators? Gnu is another name for the wildebeest that is native to Africa. Gnus are antelopes, and otherwise known as hooved, or ungulate mammals. They are prey for lions, hyenas, cheetahs, leopards, and crocodiles. The primary defensive tactic against these predators is herding where the young are protected by the older larger ones while the herd runs as a group. 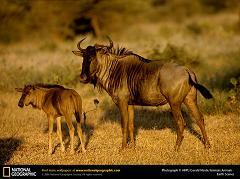 Gnus will also take turns sleeping at night while others stand guard against an attack by invading predators. Many biologists are unsure if this behavior is learned or hardwired, but is definitely sophisticated for a species of antelope. How are monarch butterflies protected against predators?